Politicians and leaders often describe America as a vast melting pot. A nation built upon immigrants and people of various cultures coming together to form one society, America has always championed equal opportunity and acceptance in all walks of life. For young children and students, this means improved learning experiences and accommodating those struggling to learn English. According to the National Clearinghouse for English Language Acquisition, from 1997 to 2009, the number of English language learners in the classroom increased by 51%. Today, over 5.3 million English learners struggle to reach the same level of achievement as their peers. To ensure these students do reach this achievement level, more teachers must improve their understanding of language acquisition by earning master’s degrees in English as a Second Language (ESL). Read on to discover how master’s programs in ESL, TESOL, or ESOL help prepare teachers to integrate theories of language learning in the classroom. 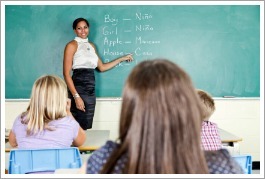 How will a graduate degree in ESL help me as a teacher? Master’s degree programs in ESL focus on providing a teacher with a greater understanding of language acquisition principles, advanced teaching and assessment methods in the ESL classroom, and research on linguistics. Beginning graduate coursework introduces teachers to research skills and resources that help them improve their understanding of how students learn languages. These resources describe the advanced teaching strategies they’ll need to implement in the classroom for successful language retention. In their programs, teachers explore concepts of phonology, syntax, and pragmatics, in addition to ways of explaining these concepts to English language learners. While coursework in the specialization gives teachers a mastery of the structure of English, they are also introduced to pedagogical aspects of the career. Graduate degree programs in ESL help teachers provide integrated-skill instruction in their diverse learning classrooms. Integrated-skill instruction is considered one of the most effective ways to engage English language learners, allowing students to practice their language skills while learning content in math, science, or social studies. For example, teachers hoping to mix content and language learning in the geography classroom might choose an interesting theme to focus on, such as natural wonders in the world. This theme provides teachers with opportunities to integrate interesting images with language learning, pushing students for greater interaction in the classroom. Students in integrated classrooms learn a wide variety of language skills while communicating about the theme, challenging them to interact naturally with the language. The knowledge master’s programs provide about integrated teaching methods allows ESL instructors to show students that English isn’t simply an academic subject, but a portal to learning and knowledge. Teachers explore the basic nature of language acquisition and the relationship between language, society, and culture. Deepen understanding of how students adsorb phonology, morphology, syntax and pragmatics. Discover research-based approaches to using inquiry and small group involvement to integrate subject area content with ESL pedagogy. Explore methods of inclusion and promote simulation and analysis to expand student understanding of language structure. Research first and second language acquisition theory, and how to develop culturally responsive teaching strategies. Design, implement, and evaluate different models and educational structures guiding ESL teaching. Learn the best ways of assessing student learning outcomes to make positive changes in the classroom. Broadens a teacher’s view of using computers with English language learners. Explore potential applications, games, projects, and exercises that facilitate the transfer of language knowledge. Schools typically offer expanded career opportunities to teachers who earn master’s degrees. While earning a master’s can improve your teaching ability, it also exposes you to leadership and management skills, allowing upward career movement. Teachers in leadership positions have greater opportunities to advocate on behalf of their students. Read on to discover how a master’s degree in ESL, TESOL, or ESOL might potentially lead to the success of your students. How will a graduate degree in ESL help my students? Nearly 10.7% of all students enrolled in public schools are English language learners, according to statistics from the U.S. Department of Education. These students experience greater difficulty achieving the same achievement scores as their peers due ineffective language teaching. The research, teaching methods, and linguistics data teachers are exposed to in their master’s degree programs help instructors approach this group of students in a more constructive way, increasing learning outcomes. By implementing the teaching strategies they learn in their graduate programs, such as integrated language learning, teachers ensure greater participation and motivation among their students. If you’re interested in learning how a graduate degree in ESL education can improve you as a teacher, research and contact school offering degree programs in the field. Pick your state from this map representing Master’s in Education programs offered across the country.